Driven by interest in yuan savings accounts, Chinese banks are enjoying a rapidly growing presence in South Korea. It is hardly news that Chinese banks are steadily growing in international influence. Half of the top ten banks in the Top 1000 Banks in the World 2014 ranking released by The Banker Magazine are Chinese. Ten years ago they were American, and twenty years ago they were Japanese. This rising influence has implications for China’s neighbors, including South Korea. Most notably, a recently concluded free trade agreement and the start of won-yuan direct trading are likely to give Chinese banks a growing presence in South Korea. According to the Korea Federation of Banks, the assets of the five Chinese banks’ operations in South Korea have increased from about 4.6 trillion won ($4.2 billion) in 2007 to about 27 trillion won ($25 billion) in 2013. The figure is expected to grow to 55 trillion ($50 billion) this year. Chinese banks have enjoyed about 20 percent growth in assets annual since 2000, but last year the growth was 88 percent and next year it is likely to top 100 percent. In fact, the growth of Chinese banks in South Korea has been so remarkable that next year they are expected to overtake American banks, the largest foreign banks in South Korea by assets. As of September, the assets held by American banks in South Korea represented 20.1 percent of the total asset holdings of foreign banks, with Chinese banks at 17.9 percent. 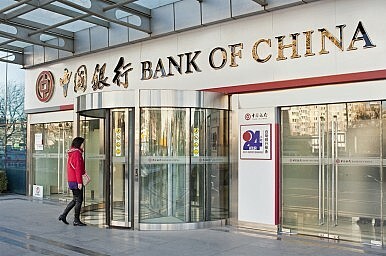 Chinese banks were followed by Japanese banks with 14.6 percent and French banks with 13.5 percent. The dramatic growth of Chinese banks reflects the increasing number of South Koreans putting their savings in yuan, to avoid the persistently low interest rates in South Korea. Yuan-denominated savings have surged from just $80 million in 2011 to $21 billion in October this year, according to the Bank of Korea. “As the interest rate is heading to one percent in South Korea, investors are looking for alternatives, and the yuan has emerged as a good option,” said Park Eun-seong, a financial consultant at Samsung Securities. Park explained that the rise in yuan savings in recent years has also been driven by growing economic exchange between South Korea and China. The two countries concluded a free trade agreement in November and started won-yuan direct trading on December 1. Whereas in the past yuan-denominated savings were the province of big business, now ordinary South Koreans are showing interest, with South Korean banks releasing yuan savings products designed to be accessible to individual customers. “People can enjoy about three percent interest on yuan savings at the moment, and I think as the interest rate gap between South Korean banks and yuan savings accounts increase, there will be rising demand for yuan savings,” Park added. In fact, South Korea’s Financial Supervisory Service announced in October that it will beef up monitoring of yuan savings accounts, as they attract more money. The FSS concluded that yuan savings accounts were not subject to concerns such as liquidity risk, but insisted that it would still monitor the accounts to protect investors and ensure that financial institutions remain liquid.